ATLANTA (July 7, 2014) – For one day only, black and white spots, cow bells and furry ears will be appropriate attire at Chick-fil-A ® restaurants across the country. As part of the Atlanta-based restaurant’s Cow Appreciation Day celebration, customers who show their spots eat free on Friday, July 11 at any one of the chain’s 1,800-plus restaurants. Chick-fil-A is offering a free breakfast, lunch or dinner combo meal, which includes an entrée, side item and beverage, to any customer who visits “head to hoof” in cow attire. Customers who are too “chicken” to go all- out in cow attire will receive a free entrée of choice for wearing a cow-spotted accessory, such as a hat, scarf, tie or purse. 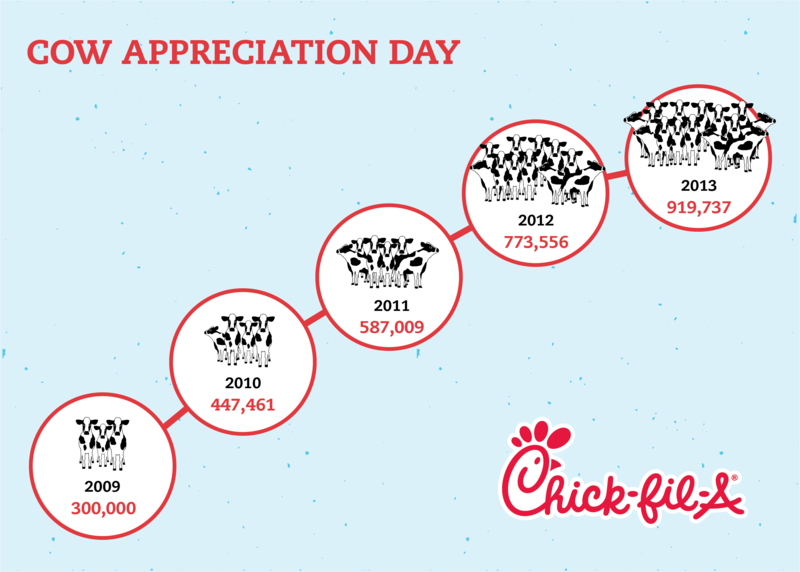 In 2013, more than 900,000 customers visited Chick-fil-A restaurants dressed as cows for Cow Appreciation Day. Chick-fil-A has a website —CowAppreciationDay.com — dedicated to the event. The site offers in-depth details on the celebration, cow costume ideas, as well as downloadable cow spots, masks and other bovine- themed accessories customers can use to create costumes. Cow costume participants can also share their Cow Appreciation Day story and pictures in a photo gallery on the site. Fans can tweet pictures of their costumes using the hashtag #CowAppreciationDay. The additional excitement around Cow Appreciation Day each year offers further proof that the passion for Chick-fil-A’s beloved bovines is stronger than ever. Since they first appeared on a billboard in 1995, the “Eat Mor Chikin” Cows have reached millions on television, radio, the internet and the occasional water tower. They are the focal point of Chick-fil-A’s in-store point-of-purchase materials, promotions, radio and TV advertising, and clothing and merchandise sales.